Plastic buckles are good but metal is better in both looks and function. 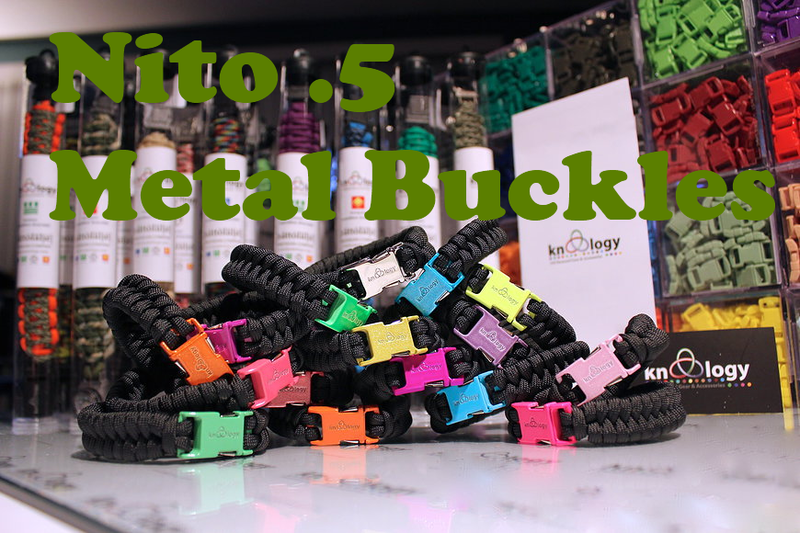 Knottology Nito 0.5 Metal Buckles can significantly increase the overall look and durability of your next paracord bracelet, or other paracord project. Made from metal, these buckles use a spring assisted clasping mechanism to connect and release. In addition to their durability the Knottology Nito 0.5 Metal Buckles are available in over 25 colours to ensure the buckle matches the paracord you selected for your project. The two piece ½ inch side release buckles are concave so they fit the wrist with comfort. Available in clover green, purple, brown, grey, pink, baby blue, black, yellow, red, magenta, silver, white, blue, olive drab, orange, navy blue, green, teal, maroon, yellow green, hot pink, neon blue and tan.